The latter – the pieces from August through October that are too good to miss – will probably be appearing over the next couple of issues ... just because. 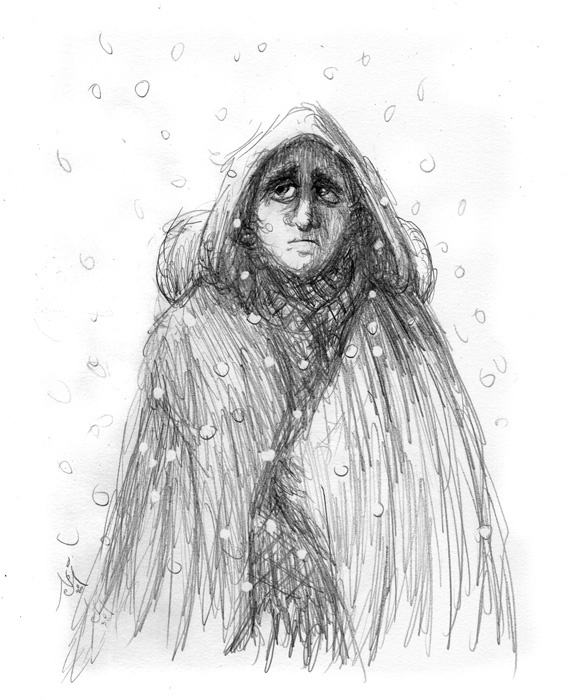 Oh, and a very merry Yule to everybody! 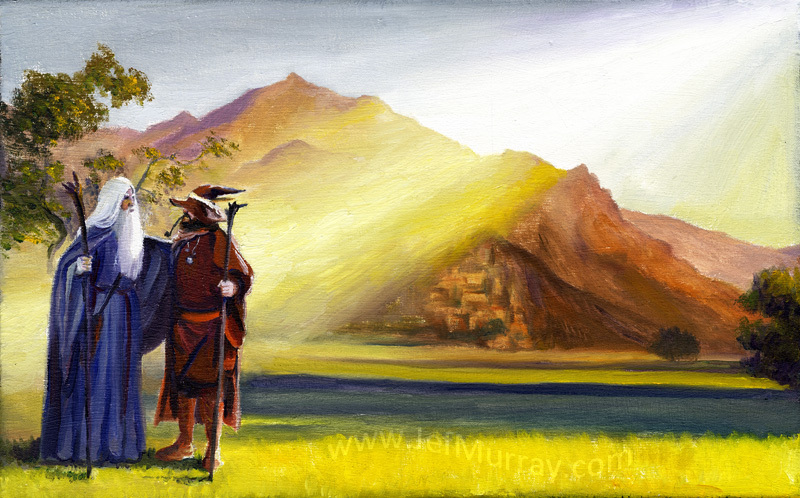 Do remember to regularly check – or, even better, subcribe to – the news from the Tolkien Society. This is one of the most exhaustive sources of various news about Tolkien (and more or less related matters, including news about Peter Jackson). An elementary guide to the question raised by the title. I remain unconvinced with regards to the implications of the Nazgûl part (the latter half of part 3), but overall the guide is fine as far as it goes. About the on-line courses taught by Dr. Dimitra Fimi. Congratulations to all the winners, but of course particularly to Jason Fisher for winning the Scholarship Award for Inklings Studies with his book, Tolkien and the Study of His Sources: Critical Essays. The story of the final defeat of the Pinus Nigra in the Oxford Botanic Garden, known for being a special favourite of Tolkien's, hit just about the turn of July, with this being released in mid-August. See also the news from the Tolkien Society on 30 July, Tolkien’s favourite tree to be cut down. Members of the Mythopoeic Society have until February 1st to nominate books for the 2015 Mythopoeic Awards. If you are not a member yet, then hurry off to http://www.mythsoc.org/join/ to join. Proceedings (a mix of abstracts, full texts and videos) from the second Mythmoot. A guest lecture with Tom Shippey to be held on 15 April 2015. If you know of anyone going, or if you find a report from this event elsewhere, I would love to know about it. Despite the obvious attraction of a theory that sets my home area at the centre of much of Tolkien's imaginative work (I do live on Zealand, a mere 15 km from the presumed site of Heorot – less than 10 miles), I do not rush to embrace Cook's theories. Or, perhaps rather, I am willing to accept them as a contributing factor in that complex network of influences and inspirations that, along with a healthy dose of original, sub-creative genius, brought about Tolkien's fiction, but I hesitate to assign a greater importance to these influences than to many of the other. A well-written blog/essay on Tolkien's connections to East Yorkshire and particularly the Holderness area and Roos. It is good to see these actual connections emphasised in a time where we are faced left and right with fallacious claims of connections to the Burren, to Ethiopia or to Pawnee legends – claims based on spurious reasoning. In this case, the research, however, is solid, and we still get to add details to our understanding of these connections as e.g. Michael Flowers builds on earlier research by Carpenter, Garth and Mathison. In celebration of the 100 years anniversary of Tolkien's poem, The Voyage of Éarendel the Evening Star, John Garth writes, inspiringly as always, on the beginning and emergence of Tolkien's legendarium – adding a particular discovery about the name Lowdham that I will encourage you to read in Garth's own words. It's been a while since his last post, but Jonathan McIntosh has now posted an interesting question on his Flame Imperishable blog. It is, admittedly, of the rather metaphysical sort (there's a reason I like his posts so much), with some interesting (albeit tenuous) connections to certain aspects of physics (I'm thinking of various interpretations of quantum physics). There is also an interesting connection to letter #153 in which Tolkien writes about sub-creation as “a tribute to the infinity of His [God's] potential variety” (I have quoted more from the letter in a comment to the blog post). A meta-comment here from Simon Cook on the tendency to approach Tolkien studies from a very narrow disciplinary perspective. Simon Cook's commentary here is mainly addressed at the English literary criticism approach to reading and understanding Tolkien, but I think it is applicable also to other approaches. For my own part, I know that I am likely to exaggerate the effect of Old Norse mythology on Tolkien's work, but I am aware of it, and I think that is an important step, and next we need scholars to start looking for the evidence and ideas that would actually falsify their own theories. This idea is intriguing, and the probability that there is something of Rhys' ideas floating around somewhere in Tolkien's Hobbits seems to me large enough to at least warrant some further study. I am, however, somewhat sceptical of the phrasing: “Did Tolkien discover Hobbits in the pages of Rhys’s writing on Welsh fairies?” to which Cook answers affirmatively. I find this an exaggeration given what also know about Wyke Smith's Snergs and Sinclair Lewis' Babbitt. It does seem likely that Tolkien had found bits and pieces in various sources, and that these combined in his mind with something of his own to become Hobbits; that is, that Tolkien discovered the Hobbits in his own mind, but that some bits of pieces of the Hobbits come from other sources, possibly including Rhys' aborigines. Full marks to Jason Fisher for his ability to imagine a time when the hobbit/habit pun was still fresh. In this post he traces the pun as far back as possible, with the earliest use discovered so far being from April 1955. Following the publication of Tolkien's translation of Jonah in Journal of Inklings Studies, Vol. 4, No. 2 (October 2014), Jason Fisher here offers the first comments, which are related to the translation of a single word. “I would always rather try to wring the juice out of a single sentence, or explore the implications of one word than try to sum up a period in a lecture, or pot a poet in a paragraph.” indeed! I am not sure that I agree with everything he says, but I do find Longenecker's perspective on the relations between Tolkien's Great War experiences and his mythological vision to be interesting (admittedly some of my scepticism may be due to some simplifications – Longenecker, I think, is not writing to Tolkien students such as myself, but to a more general audience). Michael Martinez discusses the idea of ‘what The Silmarillion might have looked like, “had Tolkien finished it”” concluding that not only were Tolkien unable to complete The Silmarillion, but we have little to guide us to where it might have gone, had Tolkien worked on it longer than he did. Amen to that! Personally I think the idea of a ‘canon’ of Tolkien's Middle-earth, however attractive, is producing more harm than good, and I would rather have people see Tolkien's work as a beautiful evolving whole. “Between the lines” is the title of this column ... beyond the lines might be a better name for this, but it seems to be the month for this kind of thing. Whence came, for instance, the idea that pipeweed is hallucinogenic? On the plus side is the aspect of explaining to a younger generation the fascination of the hippies with Tolkien's work, on the negative side is the apparent endorsement of the hippie reading of The Lord of the Rings. A commentary in a main-stream media outlet that comments on Tolkien's The Notion Club Papers is, in and of itself, interesting enough to warrant mention. Of course it doesn't hurt that the commentary appears level-headed and doesn't try to read more into Tolkien's story than the text can actually support. A link to Michael Drout's October 2014 lecture at Carnegie Mellon University. To be watched! The news that Tolkien's translation of the Book of Jonah, which he made for the Jerusalem Bible, will be published in the Journal of Inklings Studies in October. Despite warning that “Every interpreter is tempted to remake Tolkien in his or her own image.” this seems exactly what Dr. Richards is bent on doing himself in his book, The Hobbit Party. Like most (all?) other one-sided attempts at interpretative criticism, Richards' views suffer from a strong confirmation bias. This, of course, does not mean that everything that he says is wrong (most of it probably isn't); only that this interview suggests that he has never stopped to ask himself whether there might be other likely explanations than the ones he favour. Based on this interview (and some other bits and pieces) I certainly do not feel tempted to spend any money on this book. Whatever one's views, a good and envigorating discussion. If I wasn't conscientously writing up things chronologically, this piece would have made the top! Christina Scull and Wayne Hammond here announce that they are making a follow-up volume to the book The Art of The Hobbit by J.R.R. Tolkien, the next one to be The Art of The Lord of the Rings. Woohoo! To be published some time in 2015. A review of the recent biography, Tolkien by Raymond Edwards. Howse is fairly positive of this new biography, though he doesn't say what, if anything, it adds to the knowledge available from reading the books by Humphrey Carpenter (J.R.R. Tolkien: A biography and The Letters of J.R.R. Tolkien), by Christina Scull and Wayne Hammond (The J.R.R. Tolkien Companion and Guide) and by John Garth (Tolkien and the Great War). Before buying new biographical works, I think it is necessary to know what they add to our knowledge – and, frankly, if they do not add anything new (White, Grotta, ...) then I am not spending my money on them. An excellent overview of the publications of annotated editions and drafts and associated papers for all the books Tolkien published in his life. Having just received Christina Scull and Wayne G. Hammond's new edition of The Adventures of Tom Bombadil, I will have to find their 1999 edition of Farmer Giles of Ham in order to complete my set. The table of contents for volume 11 of Tolkien Studies and electronic access for the lucky people with Project Muse access to the journal. This old interview was again brought to my attention recently, and I thought it was appropriate to also remind others of its existence. A short review of Simon J. Cook's new e-book single, J.R.R. 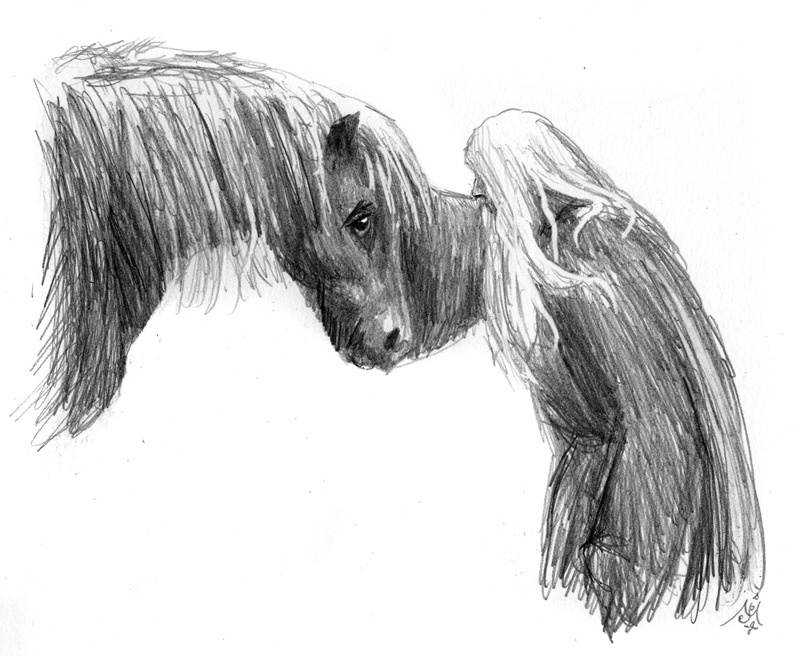 Tolkien's Lost English Mythology, which is out on Kindle. Sue Bridgwater finds that “Cook has opened up an insufficiently explored aspect of the development of Tolkien as a scholar and writer” and urges “anyone truly interested in Tolkien's work” to read it. Well, I have a high respect for Sue's opinion, but Cook's book was on my reading list even before this. 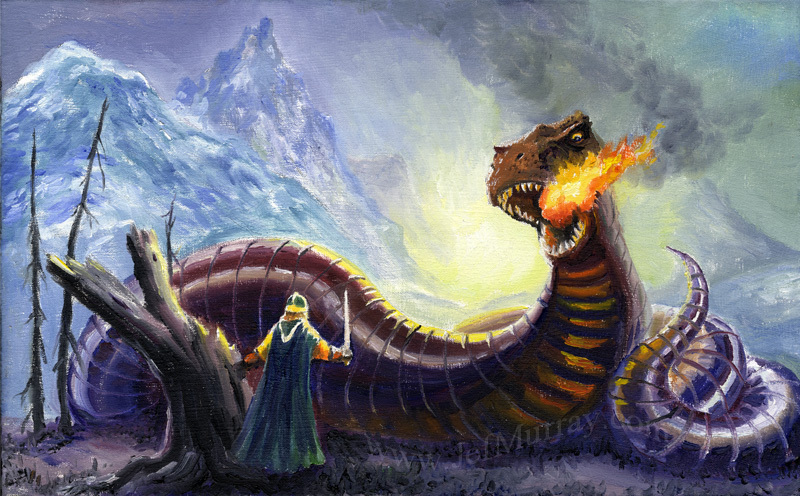 One of the less depicted of Tolkien's great worms, it is good to see Jef Murray also tackling this. 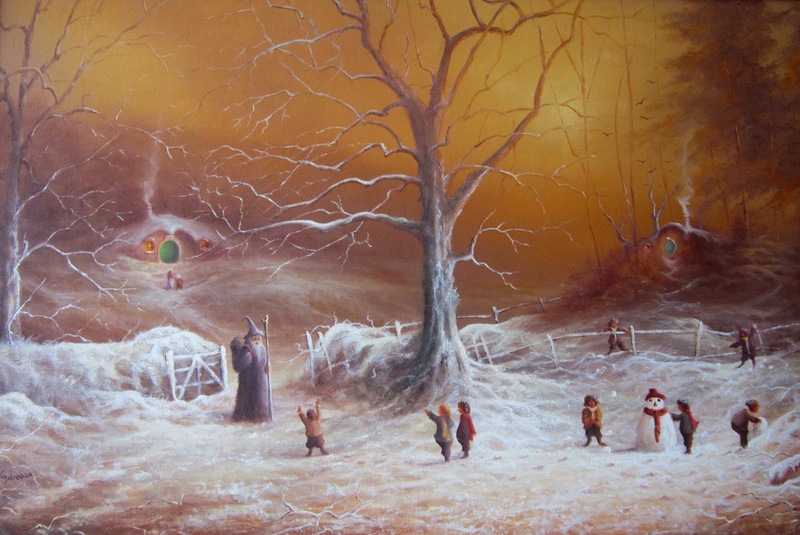 a very nice seasonal picture from Joe Gilronan depicting Hobbit children playing in the snow and a presumably well-known staff-carrying figure in grey. 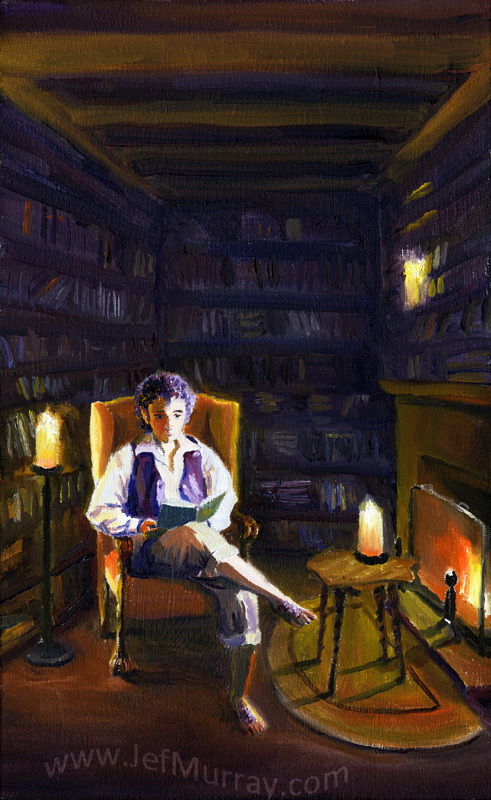 Though the fireside traveller in this case appears to be a Hobbit, I am sure that we can all recognize this mode of travelling when we find ourselves under the enchantment of Tolkien's sub-creation. On the 2015 seminar of the German Tolkien Society, with the theme ‘On Fairy-stories’. David Bratman's reports from MythCon. There is more Tolkien-related stuff in the reports from later parts of MythCon – see the reports from day 2, and from days 3 – 4. The BBC Radio 4 ‘Sunday Worship’ on 26 October was broadcast from Merton College and featured also an exploration of Tolkien's life and spirituality by Pref. Alister McGrath. The bodcast is no longer available, but transcript can be found at the page. Contents from these blogs will only be reported here if there is something that I find particularly interesting, or posts that fit with a monthly theme. However, you will find below links to monthly archives of posts for months where the blog has featured interesting posts with at least some Tolkien connection. Monthly archives not available – see the main URL above for a list of recent posts. In the time since August, the Southfarthings have finished Unfinished Tales and started (again) on The Lord of the Rings. Follow the Southfarthing Mathom for interesting and enlightening commentary on Tolkien-related books. Tolkien Studies at Popular Culture Association 2015 meeting (01 October). Simon J. Cook's blog, Ye Machine, is one of the best new things to happen in the Tolkien blogosphere for a long time (along with the new website of the Tolkien Society with the diverse posts).